King Gustav I of Arendaal ("Gustav the Great" ; "Gustav the Conqueror) (c675- 740) was the founder father of the Kingdom of Arendaal and the First King of Arendaal. In 710 he consolidated the Aren lands into a single realm, which he would rule over for thirty years, between 710 and his death in 740. He established the Kapétien Dynasty, (named for his place of birth), perhaps the oldest reigning dynastic line in Europe, which has ruled Arendaal since 710 through its various cadet branches. The Aren Crown has thus always been worn by descendants of Gustav I's, including the country's present Monarch, King Edvard V.
It is estmated that Gustav Haraldsson was born in the year 675, the third son of the King of Norskland, Harald Håkonsson, and his Queen, Åstrid Ragnvaldrsdöttir, a Princess of Norsk-Austrasia. Upon death of Åstrid's brothers, her sons became heirs to the Norsk-Austrasian throne, and following the deaths of his own elder brothers in quick succession (rumoured to have been due to foul play) Gustav became the heir of of two of the four Kingdoms that would become Arendaal. After his coronation, he set about consolidating the "Four Kingdoms" into a single entity through a combination of warfare and political alliances. Undoubtedly the most famous of these was his marriage to Alienore, heiress of the Kingdom of Neustria. It would take nearly twenty years before he managed the task of forging the four Kingdoms into the nation of Arendaal, establishing Emyn Arnen as the country's capital and Kronstad as the coronation site for its monarchs. Gustav I was born c.675, to Harald Håkonsson, King of Norskland and his second wife Åstrid Ragnvaldrsdöttir of Norsk-Austrasia. Little is known about his infancy, or even his boyhood, though it is known that he was born in the fortress city of Kapét, located some thirty miles from Emyn Arnen. He is refered to in early documents as Gustav der Kapét (literally "Gustav of Kapét") or Gustav Kapétsjarl ("Gustav Lord of Kapét"). The name of the Kapétien Dynasty derives from Gustav's place of birth, which he founded and which has ruled Arendaal ever since 710. It is known that King Harald Håkonsson had at least two other sons, both of which seem to have been older than Gustav and one of which was the child of the King's first marriage. The fact that Gustav was refered to as the "Lord of Kapét" rather than as the Son of Norskland (the general moniker applied to heirs apparent) suggests that during his early years, Gustav was not seen as a proespective heir. There is a semi-mythological story in a Norse saga relating to the reign of Gustav's father, Harald King of Norskland which describes Gustav as a "brother-slayer", claiming that he murdered his elder brother, named "Olaf Greyhide". Historians suggest, however, that the author of the saga was confusing Gustav with Eirik Bloodaxe (brother of Gustav's wife Alienore of Neustria who was well known for Fratricide (he killed four of his brothers to gain the crown of Neustria). Whatever the myths, it is known that Gustav's brothers either died or were passed over, and that only Gustav of all Harald's sons succeeded him as King of Norskland. When Gustav became a King, however, he was not only crowned King of Norskland but also of the Kingdom of Norsk-Austrasia. His mother was a princess of the realm, and after the death of her brothers, her own son stood to inherit the Kingdom. And so it was that Gustav Haraldsson became the King of both Norskland and Norsk-Austrasia in 696. Immediately upon his succession, Gustav went to war with the Kingdom of Neustria, successfully capturing vast territories. Apart from his military prowess, little record is left of his reign as King of Norskland, though his reputation as a warrior and numerous conquests suggest that he was a successful medieval King. Neustria was immensely rich, and as such, a highly desirable prize for any conqueror. Its King, Eiríkr Skjalgsson Tveskæg had just died, but his four adult sons (Rogvulf, Tryggve, Skerver and Eirik) and two daughters (Alienor and Thya), were all ambitious enough to fight for a greater share of their inheritance. One of them, Eirik Bloodaxe of Neustria, became infamous for killing his brother's to gain the Neustrian throne, and it is entirely conceivable that the "blood" component of his cognomen refers to his propensity for fratricide. Historians debate whether Eirik is resposible for the death of his third brother since Sverker died during a battle with Eirik's army. However, Eirik is known to have personally murdered his two brothers Tryggve and Rogvulf in cold blood. The former was killed with an axe, (hence Eirik's epithet) and the latter he had strangled. It is unclear who first proposed a marriage between Gustav and Alienore. Generally it is thought that Gustav sent a proposal to her after he suffered a defeat at the hands of Rogvulf, one of her brothers, who was simultaneously threatening the lands which Alienore was to inherit. Another tale suggests that Alienor offered Gustav marriage in exchange for his help in defeating her brother's army. Regardless of who proposed first, Alienor and Gustav were married in 800. 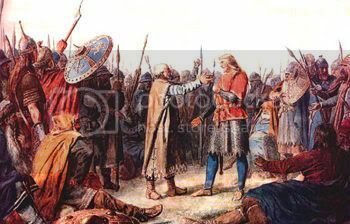 By this point only one of Alienore's brother's remained alive (having killed off his rivals), namely Eirik Bloodaxe, who was killed himself in a battle with Gustav's forces in 704 or 705. It was at this point that the combined might of the three Kingdoms turned against the Kingdom of Fjordmark. After extensive campaigns north, Gustav succeeded in deposing Fjordmark's King and having himself crowned in his stead (Gustav claimed a flimsy pretext for his conquest, as the great-grandson of a King of Fjordmark). He promptly had his second son, Ranulf married to the eldest daughter of Fjordmark's King, and establishing them as Duke and Duchess of Fjordholm. Their great-granddaughter was Nissa of Fjordholm, Queen Consort of Arendaal as the wife of King Hathor I. The unification of Arendaal has become a legend, and as such is often presented as a highly fictionalized love story by medieval authors. 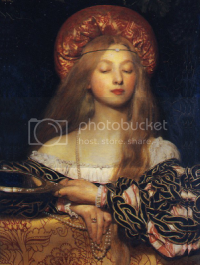 The tale begins with a marriage proposal that resulted in rejection and scorn from Alienore of Neustria, the beautiful daughter of the King of Neustria. She said she refused to marry King Gustav I of Norskland "before he was king over all of Arendaal". In reality, however, their marriage was almost certainly merely a shrewd political move by both parties. Gustav married Alienore to gain Neustria, and she married Gustav in order to establish herself as the heir to the Kingdom over her brothers. 710 AD marked the establishment of the sovereign state of Arendaal, under its first King, Gustav I. For his coronation, he chose the city of Kronstad as it lay on the common border of the three Kingdoms of Norskland, Neustria and Norsk-Austrasia. There is a suggestion that he was unable to choose the city of Inekvist (which lies in the heart of Arendaal closer to the border with Fjordmark) because regions in Fjordmark would not be properly under the control of the Aren Kings until the reign of Gustav's son, Karl I. When Arendaal became a Christian nation in the 11th century, the famous Kronstad Cathedral was constructed on the site where the Aren Kings had been crowned since the time of Gustav I. All the Monarchs of Arendaal have been crowned at Kronstad since 710. A part of Gustav's success as warrior and administrator can be traced to his admiration for learning. His reign and the era it ushered in are noted for the flowering of scholarship, literature, art, and architecture which characterized it. He took a serious interest in scholarship, promoting it at court, ordering that his children and grandchildren be well-educated, and even studying himself under the tutelage of scholars. For this reason he is sometimes called a skald, a specific kind of medieval Aren poet. Their courtly Old Norse poetry is particularly associated with the courts of Aren and Scanian leaders during the Viking age. Whether Gustav ever wrote himself is unknown, but his epithet derives from his promotion of scholars and learning at his court and the Kingdom at large. Gustav I founded the Kapétien Dynasty, which remains the dynasty ruling Arendaal into the present day. 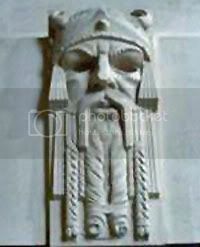 Though many Houses of the Dynasty have reigned, they are all descended from King Gustav I. Together, Gustav and Alienore were descended from the Royal Houses which ruled the four Kingdoms of Ancient Arendaal, Norskland, Neustria and Norsk-Austrasia. This makes the Kapétiens one of the oldest established dynasties in Europe, and certainly one of the most prestigious. The power of the rulers of Arendaal has not only been thanks to elightened rule or military strength but also from the many intermarriages which have taken place between the Royal House of Arendaal and foreign Royals. Such is the prolific nature of Aren Royal Intermarriages that they have given rise to the much quoted phrase: "Let others make war; you, fortunate Arendaal, marry". The first of these intermarriages was between Gustav's eldest son Karl I, and Bruunhilda of Swabia, Princess of the Duchy of Swabia, in 724. Clues as to Gustav's personality can be deduced from various sources, although no detailed record of the King's person exists today. He is described in different sources as being variously: strong, regal, just, ruthless, and cunning. Certainly his military conquests indicate that he was a gifted general and warrior. The fact that he was these two things in such a brutal time suggests that he would certainly seem ruthless and even cruel to modern society. His administrative skills and political manouvers display a shrewd and intelligent mind, while his love of learning shows us that he was a cultured patron. As for his appearance, Gustav is well known to have been tall, stately, bearded and fair-haired. His strength was remarked upon by his contemporaries, who likened him to an "ox". One chronicler tells us that: "His gait was firm, his whole carriage manly, and his voice clear, and just as strong as his size led one to expect. His eyes are sharp and piercing, his shoulders rather broad, and he is strongly built. When in anger he barks orders, but when furious he would crush a man's head in his hands without raising his voice". At the point of his coronation in 710, Gustav became one of the most powerful monarchs in Northern Europe, since the combined wealth of Norskland, Neustria, Norsk-Austrasia and Fjordmark was possibly without parallel in the region at the time. Once he was King, he set about building up the Kingdom by creating coherent systems of administration, law and taxation. He created Arendaal's first national army, reputed to be so fierce that even the Aren Vikings, many of whom had been banished from Arendaal and went about pillaging other regions in Europe dared not return to Arendaal afterwards, as they feared the armies of the Aren King. Culture, learning and trade flourished under his rule, and thanks to the strong leadership he provided, Arendaal's birth as a country was one of benefit to the peoples of the Kingdoms which were forcibly united into a single state.